The challenge over at Mix it Monthly is coffee. 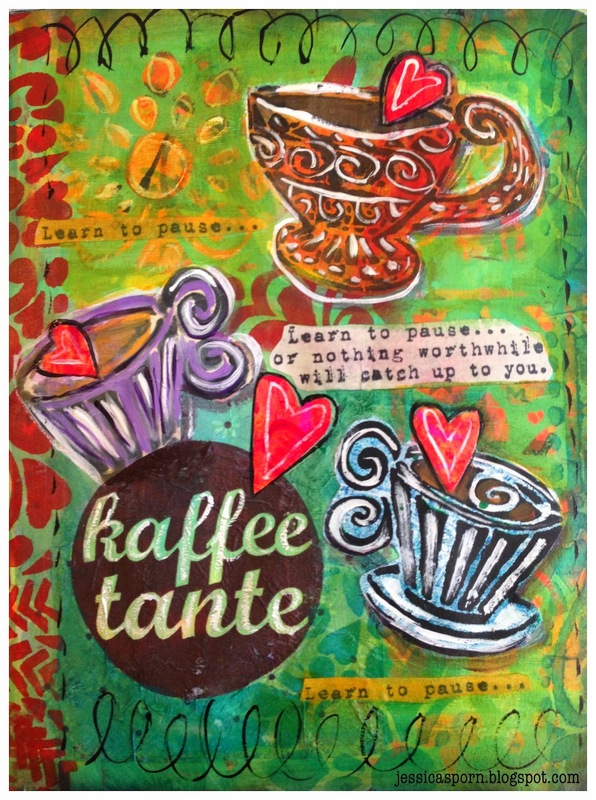 I'm more of a tea drinker myself, but I couldn't resist... Plus, a few weeks ago, I bought a painting from PiaRom/Connie, who sent it to me with a lovely assortment of napkins including the coffee napkin in this journal page. A not so subtle hint I guess! This page is the other side of the road trip page I prepped for my artsy trip in March. It already had the signposts (from a terrific stencil designed by Teri Stegmiller), but I added the cups and the sentiment: "Live your sweet life one cup at a time." The teacups are from a new Stencil Girl stencil that's in the works .... stay tuned! In the background are Mary Nasser's map 6 stencil and my Medieval Leaves stencil. Check out all the great designs at Mix it Monthly! I'm so glad I'm following your blog. I love your art, and love this. Love it, Jessica! Coffee and maps are two of my favorite things! Thanks so much for using my stencil again. You're such a talented artist! I love these pages...and coffee is certainly my thing! A wonderful answer to this month's challenge, Jessica! Since I am such a coffee fan, I need to check this out! Well you know I'm a coffee drinker. I would love to be sitting with you having a cup while we do art... someday. such awesomeness. Thanks for sharing the challenge blog... I will need to include that in my monthly art making! 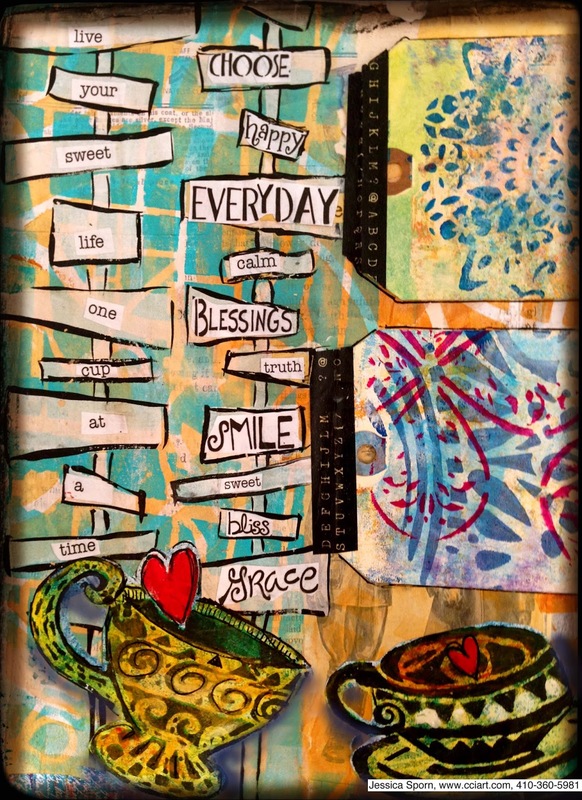 Love your journal entries ~ and the saying on your coffee page is so great ~ love it! What beautiful artwork! I know that you will enjoy the art work from Conny that you purchased also.